Wheatgrass is in a category all by itself. It is different from the Sunflower, Radish, Buckwheat Lettuce and the Pea Shoots in that wheatgrass is not a salad green. 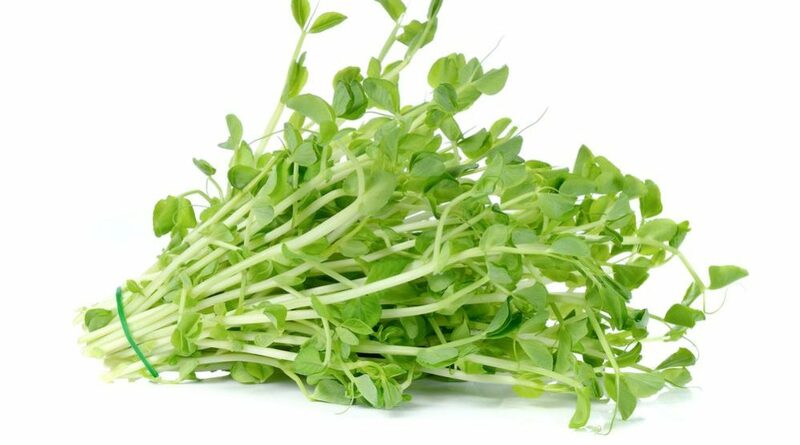 Although you can cut it up and add it to a salad for roughage, it is not as sweet and juicy or delicious tasting as the others. If you have never heard about wheatgrass or used it for its? extraordinary health benefits there is a lot of literature and several books available to read on the subject. 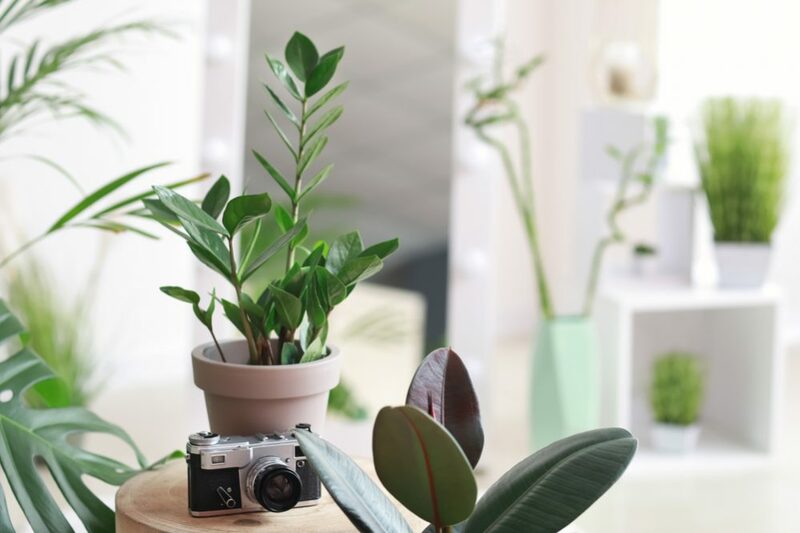 I am not going to try to go into depth on this aspect here, what I want to explain is how to grow wheatgrass using The Daily Gardener method. 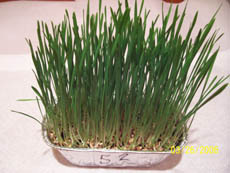 Growing wheatgrass is easy. Like the other greens the young shoots are ready to use in only seven days. 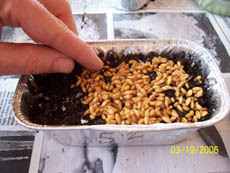 For my small tray 3 x 6, use 1 Tbsp of Hard Red Winter Wheat, soak for 6 hours and spread over the Daily Gardener Soil Mix so the seed are touching but not overlapping each other. The large tray 4 x 8, requires two Tablespoons. 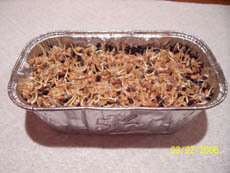 Cover the seeds with a soaked paper cover and place in a dark cupboard or closet for four days. When the grass is about two inches high, place it in the light. 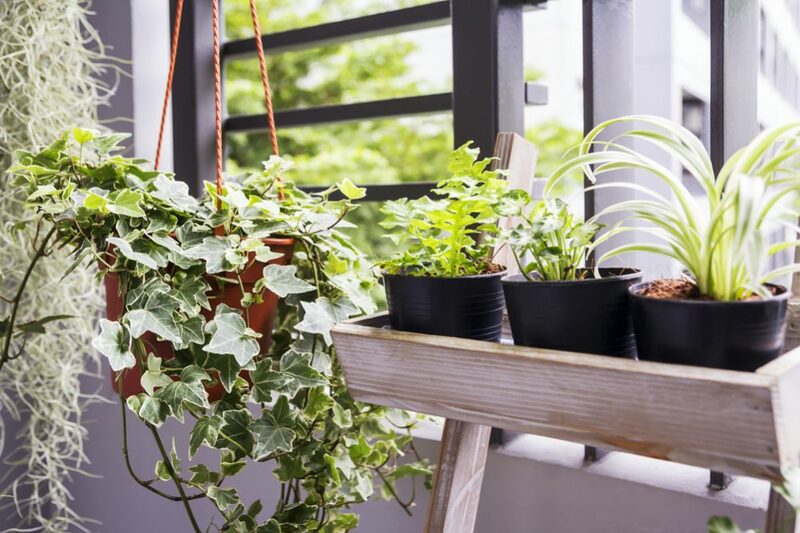 It does not need to have direct sunlight to green-up, in fact even a light bulb will work. Make sure to water the tray daily, the grass soaks up a lot of water. Usually 4 to 6 Tbsp should be about right. 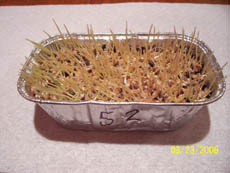 You can begin to harvest on the seventh day, the wheatgrass will continue to grow and be good for another few days. 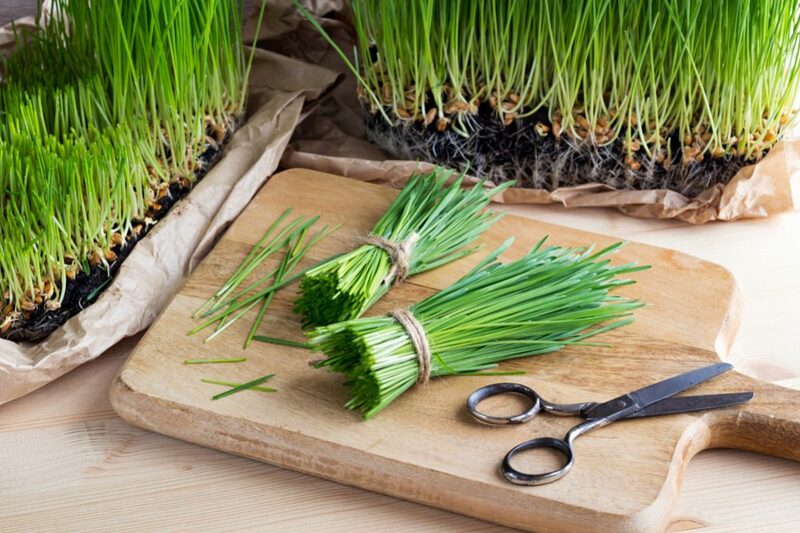 If you still have wheatgrass in the tray after that time, it will be best to cut it all and refrigerate the cuttings in a plastic bag. It is a whole different way to get your ?wheaties? than eating breakfast cereal! I use wheatgrass as a daily tonic. I clip a handful and chew on it in the morning and the evening. It is just that simple. It actually makes a great, long lasting chewing gum! So I grow a small tray daily for tonic, and I have extra available during the day to control my appetite. It is kind of like eating carrots and celery to keep from eating junk food! My wife and I have been dieting over the last year, and even though I am a vegetarian it is still easy to eat too much and gain weight. So I have been taking carrots, celery, cukes, cherry tomatoes and slices of peppers to work to snack on during the day. Now I am a more like a ‘vegetable-tarian’ from all the raw veggies I eat. It does help to control the appetite, and these are all Zero Points on the Weight-Watchers system. Just to make it perfectly clear, like chewing gum, do not swallow the grass after chewing it, just chew it like gum and dispose of the ‘gum wad’ when it looses it’s flavor! I first learned about Wheatgrass at the Hippocrates Health Institute in Boston from Victor Kulvinskas. I worked there for about six months in 1970. Victor and his mentor, Ann Wigmore, were the Raw Foods and Wheatgrass ?gurus? at that time. I t was a great learning experience for me. Just off Commonwealth Ave a few blocks from the Commons in downtown Boston this place was a haven. One whole brownstone building dedicated to teaching about Raw Foods and Wheatgrass. It was an oasis of green in the middle of the city. My job was planting greens and growing sprouts for the guests? meals among other chores. One of those chores was to plant and take care of planting Wheatgrass. I spend a lot of time in the basement where all the sprouting began. One whole room was dedicated to just composting the soil mats left over when the wheatgrass was cut; it was really something to see! It was a complete garden in the city. Wheatgrass, the cure for what ails you? Besides caring for the wheatgrass plants, I juiced the grass shoots to make the elixir that was the central therapeutic regimen at the Institute. Each guest would drink a few ounces of wheatgrass juice at every meal. Every meal was entirely Raw Foods, with the occasional cooked potato or sprouted bread. That was the one cure for everything. Victor and I would work at the Institute then drive home to Stoughton on the South East Expressway. There was a farm there that grew vegetables for the Institute; a fellow named Steven Rosoff was the Institutes? permanent gardener. We would head into Boston early in the morning so we could buy Avocados, Bananas (before they were gassed) and Mangoes by the case at Hay Market Square. It is hard to believe it was 30 some years ago! My experience at the Hippocrates Health Institute was milestone in my life. Seeing people rejuvenate their body and bring hope to their mind and spirit and to experience for myself the effects of an all Raw Food diet certainly changed my life. Thank you Victor K.
It is easier for a vegetarian today! I get a kick out of how things have changed in thirty years since I first became a vegetarian. Thirty years ago it was like being a Martian on a secret mission to earth, today being a vegetarian is easy. Go to any grocery store today and there are lots of vegetarian foods and even sprouts. Some of the food coops offer wheatgrass too! There is a vegetarian entré¥ at almost every restaurant I go to. Even Ruth Chris?s has changed its? menu! It is not that I go to a lot of restaurants, but part of my day job is attending conventions over the winter so I spend three weeks every year away from home eating exclusively at restaurants! There is usually a banquet at the end of each convention and I will make sure that the hotel staff knew I was the one, the only one, who had ordered a vegetarian dinner. It used to be they would roll their eyes and bring Ricaroni! Today, I am not the only one asking for Vegetarian meals and I have to get the recipe from the Chef the food is so good! Things have changed. A little more wheatgrass please! A change in attitude is evident even at the local pharmacy. There is a whole aisle of herbal remedies. Many people are looking for alternatives to the regular medical routine of a pill to cure every malady. But even the medical profession has changed; they do not hesitate to prescribe a change in diet and lifestyle. Quit smoking, get more exercise and eat more vegetables and whole grains, is now considered a first line of defense against heart disease. Yes things have changed and maybe some day your doctor will tell you to chew a little wheatgrass with that apple everyday! DAY 0: Plant the soaked seeds and cover with wet paper. DAY 0: Soak 1 TBSP of wheat seeds for about 6 to 10 hours. Drain and wash the seeds. Fill the tray with The Daily Gardener Mix to about ?? of the top. 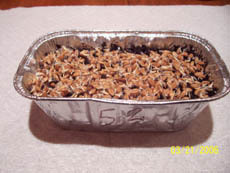 If you are using a large tray 4 x 8, soak 2 TBSP of wheat seeds. Spread the seed across the soil so the seed touch but are not on top of each other. Place soaked paper over the seeds. Tuck the paper down around the edges to form a paper cup, this way you can pour a little water on the paper to keep it moist for the 4 days that the tray is in the dark. DAY 1: Check the moisture of the paper and the soil. DAY 1: After the first day there is not much to see, but if you do peek under the paper cover you will see that there are small white tails on the seeds, jus the beginnings of the root. Be careful when you pick up the paper because sometimes the seeds stick to the paper and pulls right up with the paper! It is best just to pee by lifting a corner of the paper. DAY 2: Patience, do something else. DAY 2: The root tails and the tiny shoot of grass will both be visible. Keep the paper moist, if the paper is well soaked in the first place the paper will most likely be moist for a few days. 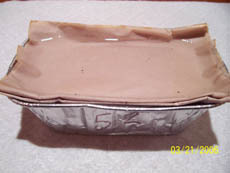 The soil too should remain moist until day 4 when the paper cover comes off and the tray go into the light. 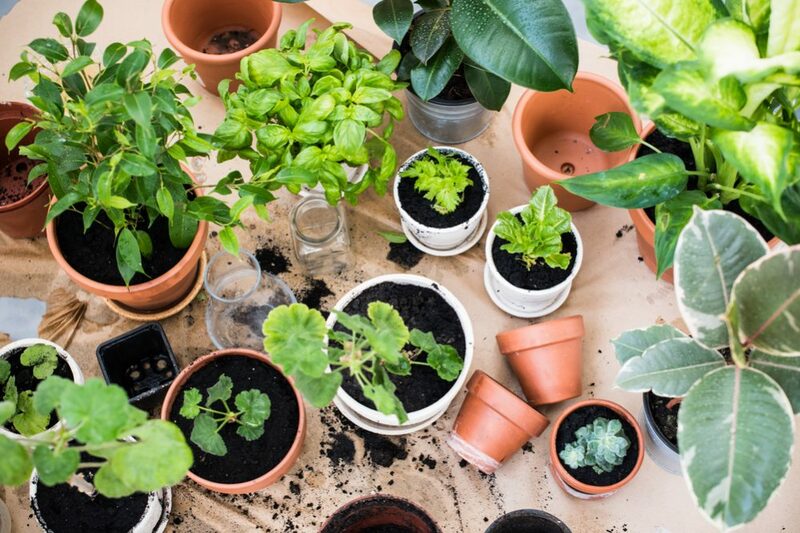 If the soil needs moisture in the first 4 days, add water to the bag of soil mix so that the soil is more moist to start with. DAY 3: Check that the soil and cover are still moist. DAY 3: There is little change today, the tiny shoots will be a little longer and may be turning from white to yellow. Keep the tray in the dark and the cover on for another day. Today you should see the grass blades pushing up the paper cover. You may want to wet the paper if it need it but let the tray stay in the day just this one more day. They will take off soon. 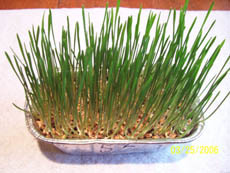 If you are in a hurry for wheatgrass go ahead and put the tray in the sun. Time to remove the paper cover and put the tray in the light. Any light source will work. 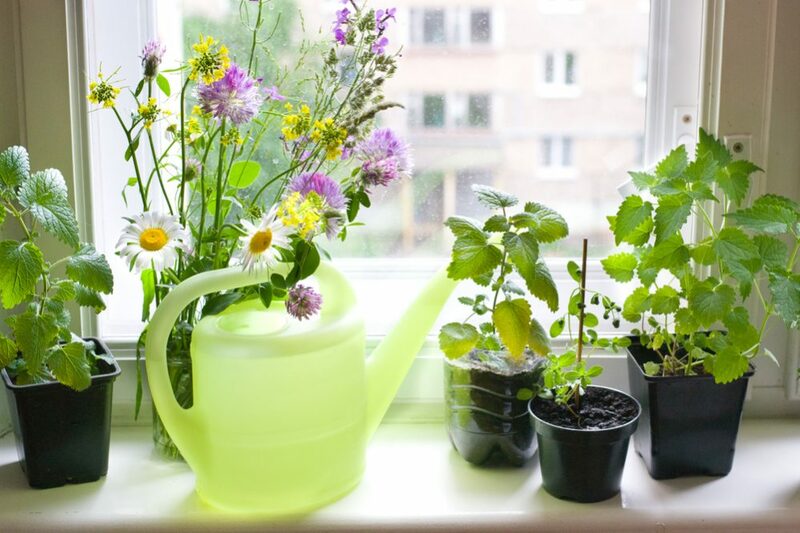 Direct sunlight will dry the soil quickly so make sure to water everyday with 2-4 Tbsp. I use a western window in my kitchen or the south facing window in the living room. If the trays are in the living room I like to drop the trays into the ceramic pots I found that will fit 2-3×6 trays or 1-4×8 tray. It looks nice while greening up; soil-sprouts in disguise! What a difference a day makes! The yellow grass stubs are green and fully formed blades. I find myself brushing the blades the same way I do Sunflower or Radish Greens to brush away the hulls. There are no hulls on the wheatgrass so there is no need do this chore for wheatgrass. The wheatgrass is ready to harvest. Since I only use the grass to chew I don’t harvest all of it at once. But if you are making Wheatgrass juice, just cut all of the grass and store it in the refrigerator until you are ready to juice the grass. This is a lot of fun to watch the process if you never use the Wheatgrass. Oh and remember to plant a tray for your cats, they love it, some people call it Cat Grass, but all it really is Wheatgrass by another name!